Home30Blogs30DaysThe Quanta LB4M – Cheap White Box Switching? “Hey,” said my friend, “are you interested in buying an Ethernet switch? 48 1Gbps copper ports and two 10Gbps fiber uplinks. Very cheap. Layer 2 only, though.” A few minutes later, we were doing business out of the trunk of his automobile. And you thought that was just a cliché, right? 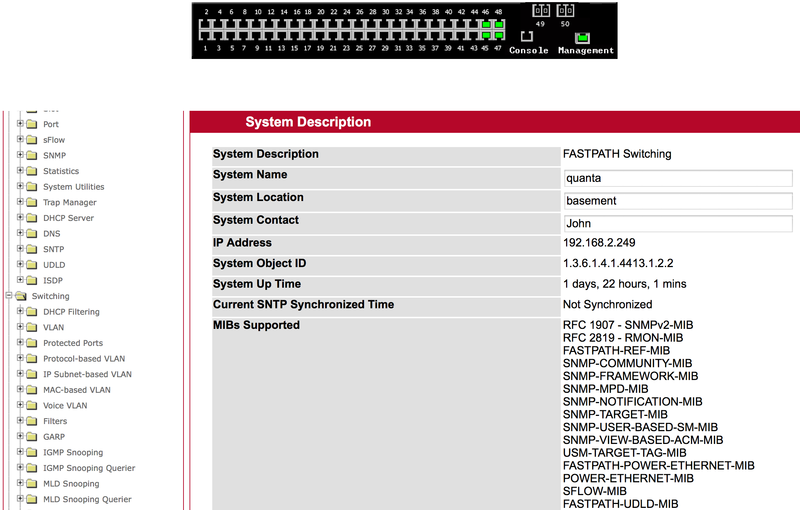 And so a largely unbranded Quanta LB4M switch has entered my life (and my home network). Let’s spin it up and see what this hunk o’ junk has to offer. First off, the switch is sporting a pretty reasonable spec. The full specifications are in this PDF – it’s the QSSC-LB400GR model. This 1U switch has a 96Gbps backplane, optional redundant PSUs (mine only has one, though) all built around the Broadcom BCM 56514 chip (two of them, I believe). It’s stackable, in theory, and according to the data sheet it supports a whole bunch of IPv4 and IPv6 protocols. Cool, and phenomenal value for the price (check out eBay to see lots of similar auctions if you’re interested). It seems that the LB4M is a classic merchant silicon ODM (Original Design Manufacturer) type box, rebranded for sale (from what I can see) by HP and Dell, and possibly others. It’s a little hard to tell, to be honest, but Quanta assures me that the just sell the hardware platform and it’s up to the vendor to put software on it. Ah yes, the software – let’s look at that. The word “Switching” is the key here. This is definitely (as advised by my friend) a layer 2 device. That’s rather odd given that the data sheet clearly said it was a Layer 2 / Layer 3 device with multiple protocol support; however this is clearly something that has to be enabled in software, and the software we have does not support it. The switch is apparently running VxWorks5.5.1 / FASTPATH, about which the documentation on the interwebs is flaky at best. Interestingly there is a manual on the web for a L2/L3/QOS Quanta LB4M which has all the lovely routing features that the spec sheet promises. However, based on web searches it seems that nobody has that elusive version of code for which the massive manual was created. In fact everything about the manual is wrong compared to what I have, down to the default console port speed setting, so heaven only knows where the routing code is! (if you know, please tell me!). In terms of CLI, it’s not often that I recommend trying the web interface on a device, but this is one of those moments. I can safely confirm that I hate the command line interface with a passion. I have been assured that users of certain HP/Dell devices will find a wincing familiarity with the whole system, though others say if you know Cisco IOS you’ll feel right at home. Well, I have a passing familiarity with IOS and I did not feel at home. Your mileage, as they say, may vary. Well, it’s functional if not pretty. The port status picture at the top is Java based, and I had to add a security exception to allow it to run. The web interface is a little bit clunky, but at least everything is there for you to find eventually. I’m assuming that whoever had this switch in the past was one of the big data center owners – an Amazon, Facebook, Google or similar. My suspicion is that they wrote their own OS to run on the Quanta LB4M hardware, and before selling them on they put on this rather crippled OS so it would run. If you work for any of those folks and can confirm or deny that you have or had Quanta LB4Ms in your data centers, I would simply love to hear from you just so I know if I’m right about the OS. Maybe you’ve even heard of this wonderful routing code for the LB4M that I’m being teased about. Meanwhile the switch it up, it’s a heck of a switch for the price, and I’m going to start testing it shortly. I’m hopeful that things like the LLDP oddity are just that – an oddity – and not an indication of more serious underlying problems. My switch came with two 10G SFP+ SR optics in the uplink ports (49 + 50); why did I not use those to link to the EX3200? Because my poor little EX3200 does not have the necessary additional modules to do so, and looking on ebay they are just a touch pricy. While I’d love a 20Gbps link between my switches simply for nerd value, I think I can live with a (currently) 4Gbps port-channel for the moment. If you’ve used one of these switches, I’d welcome your thoughts and experiences. 64 Comments on The Quanta LB4M – Cheap White Box Switching? I already has this configuration and it works great. EX3200 and EX4200 are the best Ethernet switches that ever made; i even running BGP on them! you are right; you don’t even need a 2 x 10G SFP+ Link Aggregation Group (20G LAG) for a home network, as all your home traffic will not reach 20G. the most important thing that you are having EX3200 switch that has all Layer-2 and Layer-3 protocols that you can test on the built-in 1G RJ-45 copper ports, and use it as a big Core switch for your LAN-enables devices! Exactly so. I use the EX3200 as the core switch/router for the home and lab environments. Haha 😉 Noise-wise it’s about average. Noisy is right below it in the rack (give or take some cable management) and it’s all in a closet under the stairs so at that point I don’t worry too much about the noise so long as it doesn’t whine or buzz. It certainly has a complement of fans, and I have seen others complaining about how noisy the switch is on the intarwebs. I guess it’s about the same as the EX3200 from what I can tell, but after a while the intense white noise in the closet fills my head and I can’t brain any more anyway. *nod* Same comment as above. The real limiting factor is paying $430 for the 10G module in the first place! John, you are playing with Broadcom’s OS called ICOS or Fastpath and as you can see it has some issues around support and features. It is the barest of bare-metal OS. Some of the major vendors have played around with repackaging this and also the ODMs have used it as the OS when there was nothing else. Now I think most of them prefer Cumulus over ICOS because we are a fully supported Linux OS with lots of features and automation tools but alas we do not run on that platform (it is really old, even for 1G). It is great that you point out the shortcomings because sometimes people wonder what the value of having a supported OS that runs across multiple bare-metal platforms is. Bare-metal was not successful even in many of the large datacenters because the OS and ecosystem were missing. All things Google made for themselves internally. FB is doing the same now and is very open about it. If you even would like to see what we have done for bare-metal with hands-on, we have a great online lab of real bare-metal switches with a self-paced guide and KB articles that will walk you through ZTP with Ansible and Puppet, sFlow, etc. Reach out to me on twitter and I can get you some time in the Cumulus Work Bench. Would you believe that as I drove into work this morning I was listening to the latest Software Gone Wild podcast (http://blog.ipspace.net/2014/10/cumulus-linux-in-real-life-on-software.html) with Matt Stone talking to Ivan Pepelnjak about Cumulus. The first thing I did when I got into the office was to check your HCL on the offchance that Cumulus had ever supported a limping old switch like mine! It’s a crazy small world sometimes. Thanks for your response and insights on my lump-o-metal! Truth is stranger than fiction. That was a great podcast btw. There must be a lot of those switches out there because we get asked if we support it a lot! I know that there is L3 support on it also but I have not heard anything very good about the quality of the protocols. Believe it or not though, some people are using it. I know of a production Hadoop cluster in Japan. I will take Quagga anyday myself. Any chance we could sway a Cumulus developer (or anyone else out on the interwebs for that matter) to port a version for this switch with some crowdsourced funds? As there are a TON of these switches to be had second-hand, I honestly think you would win over a ton of netdev types with support for this switch as it would become the go to switch for home labs, ergo, you will have a lot of smart people wanting to get their hands on Cumulus software to play with it for a home lab. You port it and charge $99 for a perpetual license for this switch only and I think you’ve got marketing and make a few tens of thousands of dollars in sales. I’m in! Good idea. Would love to know if it’s even possible. I just stumbled upon this blog post, is there any news on that front if this is even possible? I’ve wondered that. I have yet to find the exact same switch in Dell or HP branding, though it looks awfully like they have similar devices. If anybody has insight into this, that would be very cool! If you don’t need advanced protocols like BGP and MPLS, you can use the quiet and Fanless Juniper EX2200-C-12T-2G switch; this switch has 12 x 1G RJ-45 ports + 2 x 1G dual personality ports (each can be used either as 10/100/1000 or SFP transceiver), it supports L2 , and L3 like static routing, RIP, OSPF, IGMP querier mode, etc…, it is the most compact feature-packed switch out there, and no other brand; cisco, hp, nor dell have a little switch like this with all these features. The Quanta switch is far from useless, especially at the price (go look on ebay – they are seriously cheap). You simply can’t argue with a switch with this kind of port count and backplane for the money. I need L2 ports as much as I need L3; in fact I need way more L2 ports than L3 functions because I run a home network with a large number of devices attached to it. Thus even as a layer 2 multi-vlan switch is has a purpose, and since my EX3200 only has 24 ports, I’m better off using the cheaper Quanta ports for access then trunk the vlans over to the EX3200 for any routing. Would I prefer it if the Quanta routed, even if it were static routing? Sure. That doesn’t, IMO, make it useless though. Yes Quanta is pretty cheap, but as alternative you can get a cheap HP web-managed L2 switch with VLAN support, it is around $60 – $70 for 48 ports (HP 1810 series), and trunk it to your EX3200 (i did this configuration before), and since you are having Juniper SRX you can use it as a you home core router, and the other SRX as your core home Firewall ; i have 2 x SRX100 + 2 x EX4200 (Juniper unique EX4200 Virtual Chassis!!) + 4 x EX2200 + 3 x HP 1810 switches, one SRX100 i’m using it as an MPLS VPN end-point connected to the telecom company, and the other SRX100 as a Firewall. the 2 x EX4200 Virtual Chassis is used as Core switch and “IGMP Querier” for my converged Network (single triple-play network; Video, Voice, and Data Network), EX2200 and HP 1810 switches with IGMP snooping are trunk-ed to the EX4200 Virtual Chassis core switch, IPTV systems, Access Points, and workstations are connected to EX2200 and HP 1810 switches (access Layer switches). i will have Juniper MX5 router soon, to attach it to my network. After a long experience with playing with Cisco, HP, Dell, Juniper, Brocade, i found that Juniper is the best and second to non when it comes to triple-play/multi-play hi-speed Networks. If yopu can find an HP 1810-48 for the price point you mention ($75-$100), then that is certainly a cheap alternative. From looking around ebay for those, I couldn’t find the 48 port version for less than $400. Perhaps you have a better source or maybe the market has shifted on these and an excess that might have existed previously is now dried up. The Quanta switches, although their CLI leaves a little to be desired, are still a great switch with full VLAN abilities and a Web GUI if you prefer. While I would love to see Cumulus Linux on this switch, it’s not a bad switch for the price. What John needs to do is sell off his EX3200 and get an EX3300 to be his core switch/router and then hang a couple of Quanta LB4M’s off of it and have them connected via 10G. Just to mention, I’ve heard that Quanta is a multi-vendor ODM (original device manufacturer) and makes several of the Juniper switches as well. Of course, we all know that it is the JUNOS OS and the feature set that makes a Juniper switch better than the rest. This is a real testament to how valuable JUNOS really is. While everyone is still focused on interacting via CLI, JUNOS has got most people beat, but it will be interesting to see how this advantage shifts as SDN-controlled, CLI-less, programmatic infrastructures become the norm. I brought 2 of the Quanta LB4M switches as well. Not sure what to do with them right now. 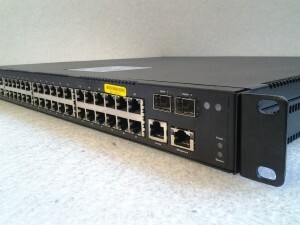 I curious about the Juniper EX3300 switch. Is there a specific model of the EX3300 you would recommend? Please advise. Any model of EX3300 would do, but since even the 24 port model has 4 x 10Gig ports built-in, you could hang off 4 of the quanta switches to give yourself a massive amount of layer-2 switch ports (192 1gig ports may be a bit overkill for a home lab) and have each of the Quanta switches connected via a 10gig connection to the EX3300, which could do all of your routing for you, since it is layer 3 capable. Or you could go with 2 Quanta switches with a LAG of 2 x 10Gig connections to the EX3300 giving yourself a oversubscription ratio of just 2.4:1. The reason I suggested the EX3300 was because of the built-in 10gig ports and Layer 3 capabilities. It helps somewhat.. So here is my situation. I have 2 SAN Servers that I want connected to my VM Host using a 10gbe connection. I purchased the Quanta LB4M (has two 10gbe SFP+ uplink ports) and 2 Brocade 1020-R SFP+ network cards. One of my SAN Servers and VM Host is connected to the 10gbe SFP+ ports on the LB4M. So do I really need the Juniper EX3300 at all? Please advise. when i worked with JUNOS, i found that it is the most efficient and feature-backed Network OS you could find out there; it also a way better than Cisco’s IOS. in fact, JUNOS depends on 802 IEEE standards, and will not cage you in to Cisco’s proprietary standards. Also JUNOS has “block-based” CLI, which make you feels that you working with object oriented programming languages like Java or C#. also if you can check JUNOS web interface you will find that 80 – 90% of the configurations can be done from that GUI (except some complex QoS/CoS and routing configurations). now, each 2 x 10G SFP+ on each storage controller was grouped together using LACP, and connected to 2 x 10G SFP+ LACP on each EX3300 switch using 10G DAC cables (SFP+ Twinax cable), the reaming 2 x 10G SFP+ slots on each EX3300 switch was utilized for “Virtual Chassis” connection between the 2 x EX3300 switches (a Juniper High availability feature on the switches level), each 1G port of each server is connected to each EX3300 switch; now all the servers are communicating with the storage in fully highly available connectivity; high availability on storage controllers level (dual controllers), on link level (LACP), on switches level (2 x EX3300 single VC), and on server connection level (2 x 1G link on each server). the communication between the storage and the EX3300 switches will load balance and failover because we are using LACP between them. I have 2 of the Quanta switches already.. So do I need a third or fourth one to do what you described above? They are cheap on Ebay. Just need to figure out how to do what you described in the WEB GUI of the Quanta switch. The 2 10Gig SFP+ ports on this make the switch a big deal. For the price, having 2 10 Gig is awesome. It would be great if someone detailed the instructions for creating a 8 port aggregation between 2 Quanta LB4m switches. Additionally I have noticed that it takes 20 to 25 seconds for a computer to establish a network connection to the LB4M switch. My computers are running Windows 8.1. It did not do this on my old network switch. Is there a setting on the switch to improve the connectivity time. I have enabled jumbo frames on all the ports on the LB4M switch. Need help…. One more thing.. It would be great if folks post some of the settings that they have changed that would optimize this switch running in a home production environment. 20-25 seconds sounds like standard Spanning Tree behavior on a port if it does not know it’s an Edge port. RSTP Edge ports are the equivalent of the old Cisco “portfast” feature, pretty much. I haven’t tested it on my LB4M yet (though I should shortly) but you should be able to configure the port as Edge, and it should come up as fast as you’re expecting. In the UI this is in System > Switching > Spanning-Tree > CST Port Configuration/Status. Pick your port number at the top and wait for the refresh, then scroll down to Auto Edge, and enable it. I’ll try to confirm shortly, but this looks like it should do the right thing. Regarding the aggregation, would you prefer command line or web interface directions? It’s not difficult to do, but it’s also not as easy as it perhaps should be. Thanks you so much for your quick response. As far setting up a LAG, can you provide the Web GUI instructions first. It would be nice to know the CLI commands as well. Enabling Auto Edge helped… Now I am down to 5 seconds… Any other settings you recommend changing to optimize the switch? Please advise. I’m guessing here that the Admin Edge option (which I had not spotted) might be even better. I interpret Auto-Edge as the switch making a best swipe at whether it’s an edge port or not (presumably based on not seeing a BPDU within a few seconds or something). Admin Edge sounds like the option to manually force it to be an Edge port. Try it – it might be even faster! …which looks good. Thanks for finding that! So should I enable both options (“Admin Edge Port” and “Auto Edge”)? Can you provide me the detail instructions on creating a dynamic link aggregation via the web interface and how to test the setup. Additionally it would be nice to know the CLI commands as well. I found this youtube video that talks about this switch. That’s similar, but has no 10G uplinks? Yes.. By the way, do you have those instructions on creating a dynamic LAG? Here is another forum that talks about this switch being the same as the Sun Netra cp3140 switch. Has anyone tried to put Indigo on these with success? I managed to brick one and it just powers up with the fans at full speed with nothing on the console. Hoping I can recover it at some point by finding the right pins for a console or link to the flash. Can someone provide some help on enabling HTTP Admin mode on the Quanta LB4M switch. I can’t access the web interface. I’ve been searching through the serial interface but have yet to find the option to enable it. Then plug into the mgmt port. I will tell you that I have had a whole heap of problems with the serviceport, especially if you try and have inband mgmt as well as using the serviceport. If a config like the above won’t get you access on the dedicated mgmt port, you might try going into config mode and try adding the network config I mentioned above and see if you can access it inband instead. Let us know how you get on! Hi. Can someone tell me how to Enter into Quanta> Shell as described in their manual. I tried several times but cannot get to access it in that Shell. This switch consumes 70w which makes them a crime to run in most countries. You are very likely better off getting a less-featured fan-less mikrotik crs226 if tco is a concern. So that is me in the video. The switches all came out of Microsoft Azure and were built with containers filled with C6100 3 node servers by Quanta/Dell. There is a dual PS and single PS version of the switch. I think there is no spanning tree on these so careful connecting both 10GB ports. Quanta just announced a new FANLESS 48 port 1G with 4x 10 GB and full OS all L2 and some L3 for about $680 street price. 0 fan and 0 noise for home. I am going to try and re-do the security and wifi networks here around them. we sneak all of that stuff in a cloaset. Nice! Thanks for identifying yourself and sharing that info. The lack of fans would definitely be appreciated, though I should probably ditch my Juniper EX as well for the same reason. Well, and the servers. Gah. Does anyone have any recomondations for 48x SFP as low price or used model? For certain nerd “value” I bought a symetric fiber uplink some years ago… Theres still a lot capacity left, so I could share with them easily. Nice. https://library.netapp.com/ecm/ecm_download_file/ECMP1117863 appears to be such a document, and from a quick glance through appears to confirm what you say. Thank you! The hardware on the CN1610 isn’t quite the same, but it does run FASTPATH so the manual is definitely helpful. How good are these for just being a ‘dumb’ L2 switch? We have an older Dell 2748, but need more ports and the Quanta looks like it might be a good fit on the cheap. I didn’t get a notification about the reply earlier. 🙁 Thank you for your insight! I’m new with this switch, bought it at the web. Now, I tryed to connect to my LAN. The switch starts up, gets a local IP address, but I cannot access the web interface. What I have to do to access it? May you can help? I can’t access the web interface and all the ports are off. How to enable for the web interface? many times the in-band interface, but it dosen´t work and I can´t open the GUI in my browser. What can I do ? The web interface if this switch is very similar to RackSwitch G8124-E which is now Lenovo. So to me this is a White box switch/bare metal switch. just got 8x of the LB4M switches. I need to LAG the 2x 10Gbps SPF+ ports to 2x Arista 7050S 52-port SPF+ switches. I created the LAG on Arista & LB4M, the LAG came up and no error, but it is not passing any VLAN. I set up the VLAN on the LB4M using the GUI.